72 MMS October 2017 mmsonline.com FEATURE plastic injection molds and progressive die sets. It has a diverse array of machining equipment in its 10,000-square-foot facility, including CNC mills, turning centers, grinding machines, and wire and sinker EDM equipment. 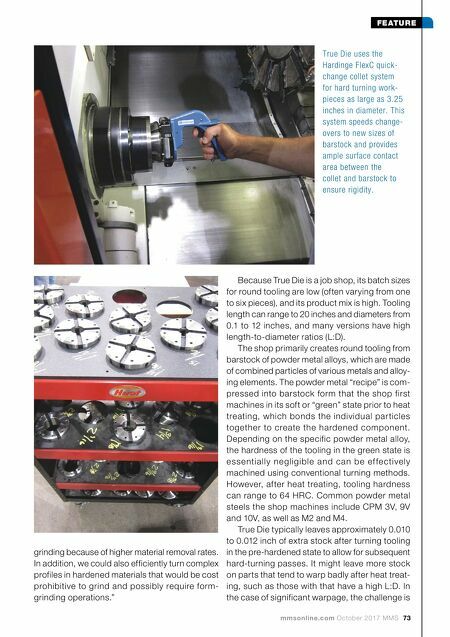 Brian Brown, True Die's president, says the deep-draw metal-forming industry represented an opportunity for the shop to diversify into a new market that complements the others it serves. "Our expertise of the application of deep-drawn stamping positioned us uniquely as a tooling supplier, enabling us to bring tangible solutions and higher performing tools to the market," Mr. Brown says. "With well over 100 years of combined experience in the design, development and pro- duction of drawn stampings, we were well prepared with a thorough understanding of the unique requirements of that industry." At the time of the purchase, Contour was solely manufacturing molds and dies. Developing a strategic partnership with a deep-draw stamping company enabled and two additional customers that provided diversification and the opportunity for rapid growth, the shop to nicely round out its offerings by establishing what Mr. Brown calls its "details department," which provides individual components for new and existing deep-draw tools and automated assembly equipment. In fact, the details work currently represents 50 percent of the shop's sales, and the company has grown nearly 700 percent in the two years since entering the details market. This round tooling is used in complex, progres- sive and deep-draw dies used to create compo- nents (t ypically cylindrical) from sheet metal (commonly stainless steel), primarily for automo- tive applications, such as components for fuel, braking and airbag systems. "We originally assumed we'd need to purchase a more capable cylindrical grinding machine to attain the tolerances and finishes the round tooling required," Mr. Brown says. 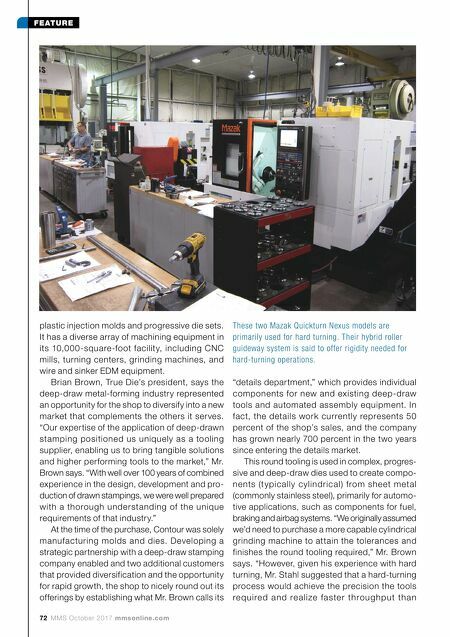 "However, given his experience with hard turning, Mr. Stahl suggested that a hard-turning process would achieve the precision the tools re quire d a nd re a lize fa ste r throu ghpu t tha n These two Mazak Quickturn Nexus models are primarily used for hard turning. Their hybrid roller guideway system is said to offer rigidity needed for hard-turning operations.